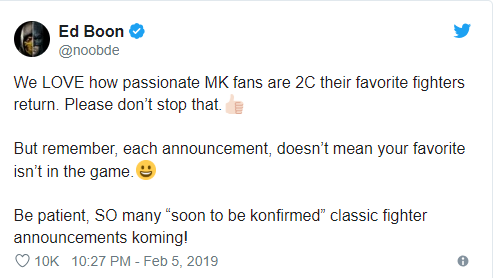 Mortal Kombat Co-Creator Ed Boon all but assured everyone via Twitter that your favorite Fighter from the series has a great chance at being in their latest entry, Mortal Kombat 11. Below is his exact tweet. He also proceeded to clear up many rumors that “ALL” of the OG characters that will be added later will be via DLC. This coming after several Youtube videos surfaced claiming that this would happen. Just recently as yesterday, Fan-Favorite Kabal and D’Vorah (debuted in MKX), were revealed. There’s always been something pleasant about the way Mortal Kombat reveals their fighters, I’m sure many of us want to see all of the classic warriors in the game, but we also have to take a realistic approach and realize that not everyone can make the cut. Prime example, me personally would love to see Mileena back, as she was my 2nd favorite character in the game next to Jason, but it probably won’t happen. Mortal Kombat fans can be some of the most passionate fan bases in the Fighting Game Community and NetherRealm almost always listens to them, so we can only hope for a happy medium when it comes to who’s gonna be in, and who will be left out at launch, and of course we already know that months after the initial release, there will be DLC fighters waiting to join the action.